CST's PathScan® Phospho-Akt (Thr308) Sandwich ELISA Antibody Pair is offered as an economical alternative to our PathScan® Phospho-Akt (Thr308) Sandwich ELISA Kit #7252. Capture and Detection Antibodies (100X stocks) and HRP-Conjugated Secondary Antibody (1000X stock) are supplied. Sufficient reagents are supplied for 4 x 96 well ELISAs. The Akt Rabbit Capture Antibody is coated in PBS overnight in a 96 well microplate. After blocking, cell lysates are added, followed by Phospho-Akt (Thr308) Mouse Detection Antibody and HRP-conjugated Anti-Mouse IgG. HRP substrate, TMB, is added for color development. 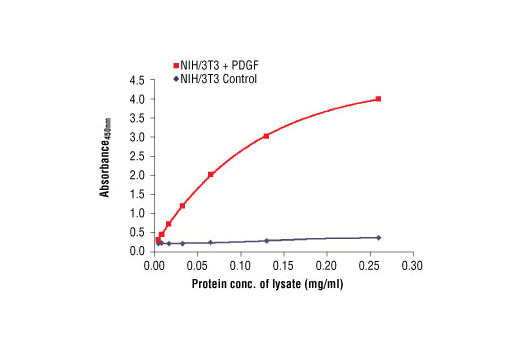 The magnitude of the absorbance for this developed color is proportional to the quantity of phospho-Akt (Thr308) protein.Antibodies in kit are custom formulations specific to kit. CST's PathScan® Phospho-Akt1 (Ser473) Sandwich ELISA Antibody Pair is offered as an economical alternative to our PathScan® Phospho-Akt1 (Ser473) Sandwich ELISA Kit #7160. Capture and Detection antibodies (100X stocks) and HRP-Conjugated Secondary Antibody (1000X stock) are supplied. Sufficient reagents are supplied for 4 x 96 well ELISAs. The Phospho-Akt (Ser473) Rabbit Capture Antibody is coated in PBS overnight in a 96 well microplate. 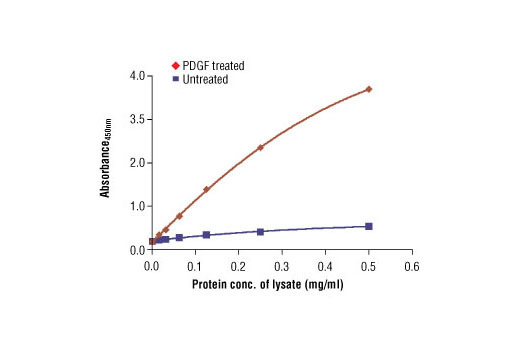 After blocking, cell lysates are added followed by Akt1 Mouse Detection Antibody and HRP-conjugated Anti-Mouse IgG. HRP substrate (TMB) is added for color development. 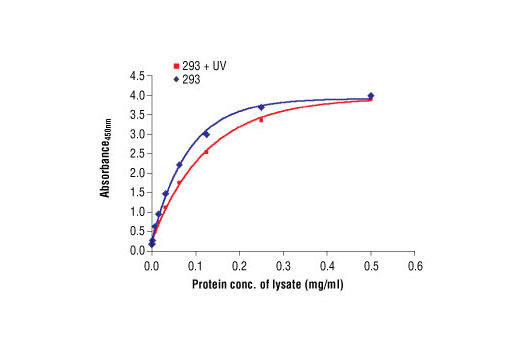 The magnitude of the absorbance for this developed color is proportional to the quantity of phospho-Akt1 (Ser473) protein.Antibodies in kit are custom formulations specific to kit. CST's PathScan® Total SAPK/JNK Sandwich ELISA Antibody Pair is offered as an economical alternative to our PathScan® Total SAPK/JNK Sandwich ELISA Kit #7330. Capture and Detection antibodies (100X stocks) and HRP-conjugated secondary antibody (1000X stock) are supplied. Sufficient reagents are supplied for 4 x 96 well ELISAs. The SAPK/JNK Capture Antibody is coated in PBS overnight in a 96 well microplate. After blocking, cell lysates are added followed by SAPK/JNK Detection Antibody and Anti-Rabbit IgG, HRP-conjugated antibody. HRP substrate, TMB, is added for color development. The magnitude of the absorbance for this developed color is proportional to the quantity of total SAPK/JNK protein.Antibodies in kit are custom formulations specific to kit. CST's PathScan® Total Akt1 Sandwich ELISA Antibody Pair is being offered as an economical alternative to our PathScan® Total Akt1 Sandwich ELISA Kit #7170. Capture and Detection antibodies (100X stocks) and HRP-conjugated secondary antibody (1000X stock) are supplied. Sufficient reagents are supplied for 4 x 96 well ELISAs. The Akt Rabbit Capture Antibody is coated in PBS overnight in a 96 well microplate. 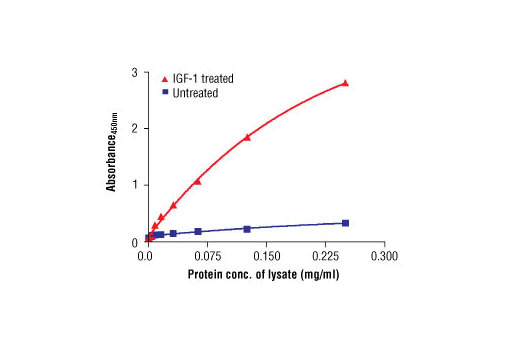 After blocking, cell lysates are added followed by Akt1 Mouse Detection Antibody and HRP-conjugated Anti-Mouse IgG. HRP substrate, TMB, is added for color development. 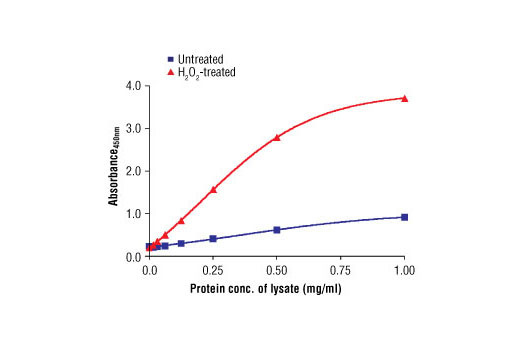 The magnitude of the absorbance for this developed color is proportional to the quantity of Total Akt1 protein.Antibodies in kit are custom formulations specific to kit. CST's PathScan® Phospho-SAPK/JNK (Thr183/Tyr185) Sandwich ELISA Antibody Pair is offered as an economical alternative to our PathScan® Phospho-SAPK/JNK (Thr183/Tyr185) Sandwich ELISA Kit #7325. Capture and Detection antibodies (100X stocks) and HRP-conjugated secondary antibody (1000X stock) are supplied. Sufficient reagents are supplied for 4 x 96 well ELISAs. The Phospho-SAPK/JNK (Thr183/Tyr185) Capture Antibody is coated in PBS overnight in a 96 well microplate. After blocking, cell lysates are added followed by SAPK/JNK Detection Antibody and Anti-mouse IgG, HRP-conjugated Antibody. HRP substrate, TMB, is added for color development. The magnitude of the absorbance for this developed color is proportional to the quantity of Phospho-SAPK/JNK (Thr183/Tyr185) protein.Antibodies in kit are custom formulations specific to kit. CST's PathScan® Phospho-AMPKα (Thr172) Sandwich ELISA Antibody Pair is offered as an economical alternative to our PathScan® Phospho-AMPKα-(Thr172) Sandwich ELISA Kit #7959. Capture and Detection antibodies (100X stocks) and Anti-Mouse IgG, HRP-linked Antibody (1000X stock) are supplied. Sufficient reagents are provided for 4 x 96 well ELISAs. The AMPKα Rabbit Capture Antibody is coated in PBS overnight in a 96 well microplate. After blocking, cell lysates are added followed by a Phospho-AMPKα (Thr172) Mouse Detection Antibody and Anti-Mouse IgG, HRP-linked Antibody. HRP substrate, TMB, is added for color development. 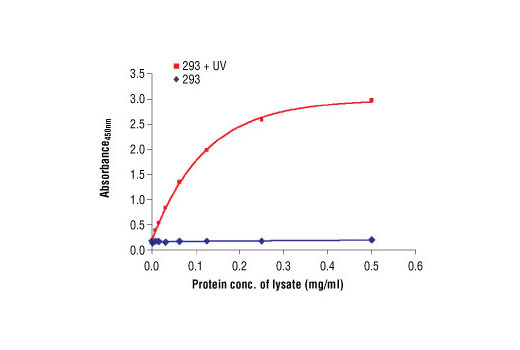 The magnitude of the absorbance for this developed color is proportional to the quantity of Phospho-AMPKα (Thr172) protein.Antibodies in kit are custom formulations specific to kit. CST's PathScan® Phospho-p44/42 MAPK (Thr202/Tyr204) Sandwich ELISA Antibody Pair is offered as an economical alternative to our PathScan® Phospho-p44/42 MAPK (Thr202/Tyr204) Sandwich ELISA Kit #7177. Capture and detection antibodies (100X stocks) and an HRP-conjugated secondary antibody (1000X stock) are supplied. Sufficient reagents are supplied for 4 x 96 well ELISAs. The Phospho-p44/42 MAPK Rabbit Capture Antibody is coated in PBS overnight in a 96 well microplate. After blocking, cell lysate is added followed by a p44/42 MAPK Mouse Detection Antibody and an HRP-conjugated Anti-Mouse IgG Antibody. HRP substrate, TMB, is added for color development. The magnitude of the absorbance for this developed color is proportional to the quantity of p44/42 MAPK phosphorylated at Thr202/Tyr204.Antibodies in kit are custom formulations specific to kit. Cell Signaling Technology's PathScan® Phospho-p70 S6 Kinase (Thr389) Sandwich ELISA Antibody Pair is offered as an economical alternative to our PathScan® Phospho-p70 S6 Kinase (Thr389) Sandwich ELISA Kit #7063. Capture and detection antibodies (100X stocks) and an HRP-conjugated secondary antibody (1000X stock) are supplied. Sufficient reagents are supplied for 4 x 96 well ELISAs. The p70 S6 kinase rabbit capture antibody is coated onto a 96 well microplate overnight in PBS. 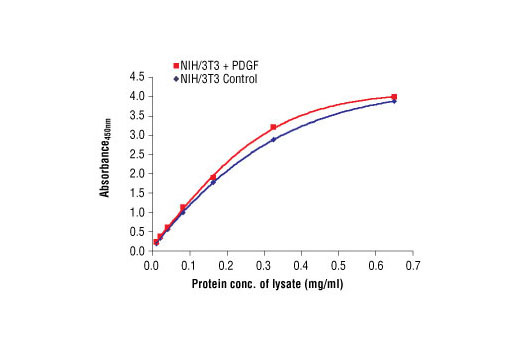 After blocking, cell lysates are added followed by a phospho-p70 S6 kinase (Thr389) mouse detection antibody and anti-mouse IgG, HRP-linked antibody. HRP substrate (TMB) is then added for color development. 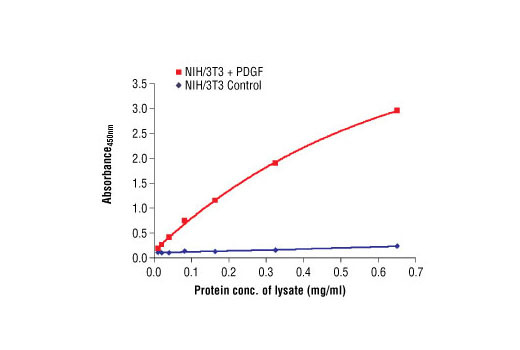 The magnitude of the absorbance for this developed color is proportional to the quantity of phospho-p70 S6 kinase (Thr389).Antibodies in kit are custom formulations specific to kit. Background: p70 S6 kinase is a mitogen activated Ser/Thr protein kinase that is required for cell growth and G1 cell cycle progression (1,2). p70 S6 kinase phosphorylates the S6 protein of the 40S ribosomal subunit and is involved in translational control of 5' oligopyrimidine tract mRNAs (1). A second isoform, p85 S6 kinase, is derived from the same gene and is identical to p70 S6 kinase except for 23 extra residues at the amino terminus, which encode a nuclear localizing signal (1). Both isoforms lie on a mitogen activated signaling pathway downstream of phosphoinositide-3 kinase (PI-3K) and the target of rapamycin, FRAP/mTOR, a pathway distinct from the Ras/MAP kinase cascade (1). The activity of p70 S6 kinase is controlled by multiple phosphorylation events located within the catalytic, linker and pseudosubstrate domains (1). Phosphorylation of Thr229 in the catalytic domain and Thr389 in the linker domain are most critical for kinase function (1). Phosphorylation of Thr389, however, most closely correlates with p70 kinase activity in vivo (3). Prior phosphorylation of Thr389 is required for the action of phosphoinositide 3-dependent protein kinase 1 (PDK1) on Thr229 (4,5). Phosphorylation of this site is stimulated by growth factors such as insulin, EGF and FGF, as well as by serum and some G-protein-coupled receptor ligands, and is blocked by wortmannin, LY294002 (PI-3K inhibitor) and rapamycin (FRAP/mTOR inhibitor) (1,6,7). Ser411, Thr421 and Ser424 lie within a Ser-Pro-rich region located in the pseudosubstrate region (1). Phosphorylation at these sites is thought to activate p70 S6 kinase via relief of pseudosubstrate suppression (1,2). Another LY294002 and rapamycin sensitive phosphorylation site, Ser371, is an in vitro substrate for mTOR and correlates well with the activity of a partially rapamycin resistant mutant p70 S6 kinase (8).